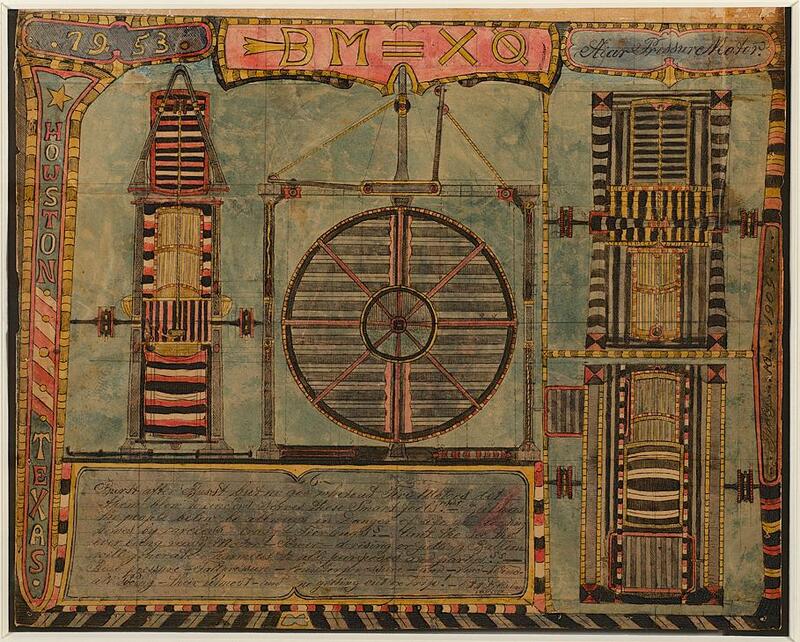 Charles Dellschau: The artist's scrapbooks documenting the Sonora Aero Club. Charles Dellschau, a Prussian immigrant who came to the U.S. in 1853, was a butcher who lived in Houston. 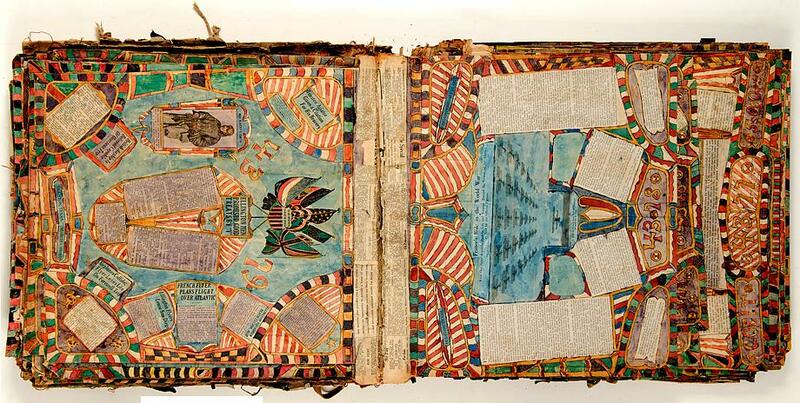 He spent the years between the turn of the century and his death in 1923 working on these scrapbooks, which combined news clippings, text, and art in visions of fantastic flying machines. 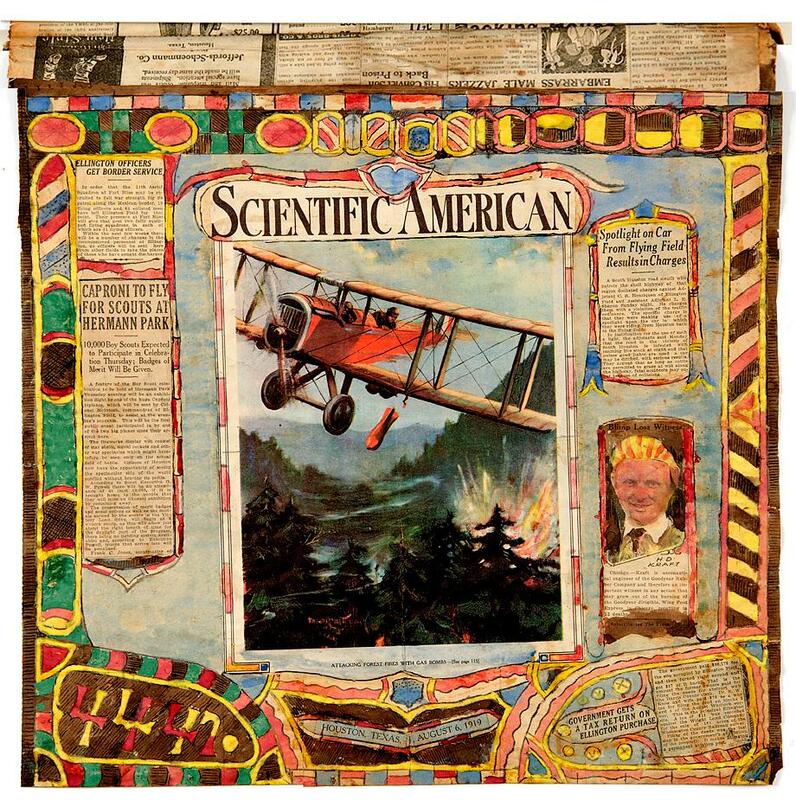 By deciphering the text on the books’ pages, as well as writings Dellschau left behind alongside the scrapbooks, Houston artist Pete Navarro found that the books were the records of a secret—and probably fictional—organization that Dellschau called the Sonora Aero Club. Dellschau identified himself as the draftsman of the club, which he claimed had formed during the California gold rush. Dellschau’s history of the club recorded that one of the members had discovered a secret source of energy—called, variously, “Supe,” “NB Gas,” or “Suppa.” This energy source allowed for all kinds of experimental flight. Dellschau’s pages interspersed his airship designs, which depended on Supe for power, with collaged newspaper and magazine articles about early attempts at flight and descriptions of the club’s wild adventures. While some UFOlogists have argued that the Sonora Aero Club was real and that sightings of flying objects around Oakland in the 1890s may have been Supe-fueled craft, no other records of the club have been found. Another investigator, William Steen, pieced together the chronology of Dellschau’s life and was unable to pin down his activities during the years of the gold rush.The organization was most likely purely Dellschau’s fantasy, stoked by the many wild, futuristic depictions of flight in the media of the time. The first monograph on Dellschau’s work comes out at the end of this month. Thanks to Stephen Romano. Image courtesy of Stephen Romano.